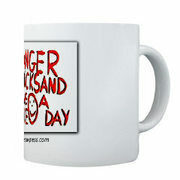 A newly-formatted version of Danger Quicksand – Have A Nice Day is coming out of my new HP 5740 Deskjet as I write this. The last few days have been a real challenge. I forced myself to learn Adobe InDesign so I could design the book so it could be printed. This was going reasonably well when I realized that my 15 inch monitor was not able to display all of the palettes needed to run InDesign efficiently. A page layout application like InDesign needs twice the working area of a word processing application. When you have many controls for managing the design of a document, you need to be able to see them all at the same time. Stacking them just doesn’t cut it! I went to Best Buy on a dead run and bought a 19 inch display. This doubled my editing speed and was a huge time-saver. As I closed in on the final editing phases, my faithful HP 5550 printer started jamming and could not be coaxed back into normal operation. My backup printer, an HP 1315, also started acting up and I decided that I needed a new and faster more reliable printer. I went back to Best Buy this morning and found the simplest and fastest printer they carried. It was the HP 5740 deskjet. I threw it in the back of the van and raced home, stopping only to pick up 300 pounds of corn for the deer at the local feed store. After putting out corn for the deer and making a round of lattes, I was able to get the book through a couple of revisions and do a woodworking chore for neighbor. Gretchen is going over the book with a fine-toothed comb and is helping me remove some of the words I seem to have invented. All in all, it looks pretty good, although I find myself going into serious effort by the fifteenth pass through the book. My unfamiliarity with InDesign occasionally causes a ripple effect which propagates unwanted changes throughout the entire 220 pages. However, all’s well that ends and the book design process is ending. Tomorrow, I hope to finish the cover redesign and send the files off to a printer. I still haven’t decided who will print the book, but it will be one of three printers. Any one of them is able to do an excellent job at an economical price. I plan to print 500 books at a time until demand indicates otherwise. All three have provided excellent service so far and they are all highly recommended by their customers. If you have a short run printing project, I don’t think you could go wrong with any one of them. Now all I have to do is to get my files to one of them and wait anxiously for the proofs to come back. That will be a whole new adventure. Incidently, I just received the shipment of Danger Quicksand coffee mugs which are scheduled to be sent out to all of you whose quotes appear in the book. The only thing I am missing is your addresses. I will contact you by email, but you know who you are and you can help me out by sending me an address where UPS can deliver. This entry was posted in Self-Publishing. Bookmark the permalink. Bigtime lurker here. New book…new monitor… new printer… new corn for the deer… deer even… lattes… and a woodworking project. May I say sir that you are living my dream life : ) Thanks for the great posts and I look forward to hearing more. You might want to look at publishing through an on demand publisher like 1stBooks Library or Xlibris. They use a printer called Lightning Source (I used to work there) that can print one book at a time and ship them to any bookstore in the world (including Amazon.com!). It is a big advantage to have your books listed on Amazon and in the Ingram book system (they are the company that supplies 80% of the bookstores in the USA). Plus, you don’t need to keep printing short runs and have inventory on-hand to mail.